On the morning of September 14, 1814, Major George Armistead signaled the American victory in the war of 1812 by raising the first American flag over Fort McHenry. The incident inspired poet Francis Scott Key to write the Star Spangled Banner, which would eventually be declared this country's national anthem. On June 13, the city of Baltimore kicked off a three-year national commemoration of the events of 1812 with the Star Spangled Sailabration, a seven-day festival of concerts, celebrations, fireworks, an international parade of ships, and a rousing air show featuring the Blue Angels. 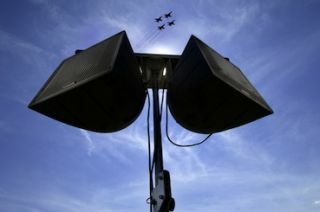 To provide audio support for the Blue Angels air show, Continental Air Show Productions selected a dozen Community R.5HPT loudspeakers. "Obviously, the biggest challenge in providing sound for a Blue Angels air show is competing with the ambient noise of the jets themselves," CASP's Dave Olmstead said. "The Community R-Series has been our first choice for our shows over the years, because it's the only loudspeaker that can provide the levels we need, for the very large coverage areas we have to address, and do it with an exceptionally high degree of intelligibility."